People watch a TV screen showing file footage of North Korean leader Kim Jong Un and Chinese President Xi Jinping, right, during a news program at the Seoul Railway Station in Seoul, South Korea, Tuesday, Jan. 8, 2019. 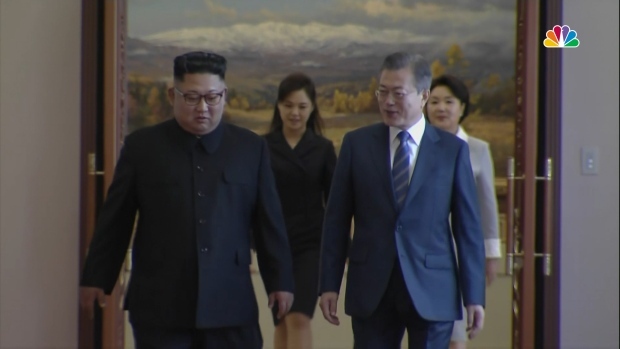 Kim is making a four-day trip to China, the North's state media reported Tuesday, in what's likely an effort by Kim to coordinate with his only major ally ahead of a summit with U.S. President Donald Trump that could happen early this year. The Korean letters on the screen read: "Kim Jong Un visited China last March." 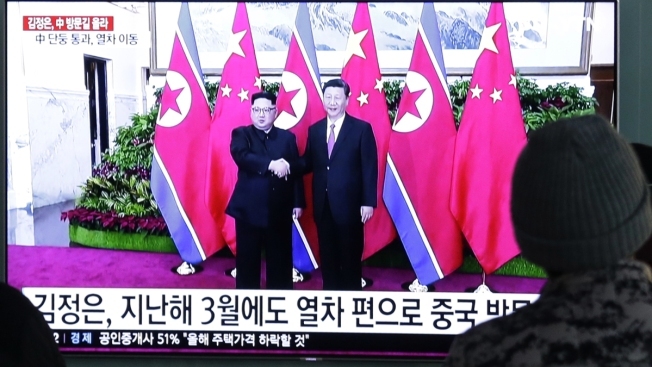 North Korean leader Kim Jong Un likely used a trip to China to talk with President Xi Jinping as a way to indicate to U.S. President Donald Trump that he's got power in negotiations over Noth Korea's nuclear arsenal, experts told NBC News. Kim took a luxury train plated with armor to Beijing on Tuesday for the talks, their fourth summit. If it follows a pattern set last year, it will precede a meeting with Trump or South Korea's president. "Kim is probably using [the meeting] as a way of indirectly signaling to Donald Trump that he has other options, that the U.S.-North Korea relationship is not the only game in town," said John Nilsson-Wright of London think tank Chatham House. According to Victor GAO, vice-chairman of the Beijing-based Center for China and Globalization think tank, the meeting demonstrates that Kim has China's backing, and Kim "wants to be in a situation where he can engage with President Trump as an equal."